Product prices and availability are accurate as of 2019-04-24 06:06:20 UTC and are subject to change. Any price and availability information displayed on http://www.amazon.com/ at the time of purchase will apply to the purchase of this product. Our Stainless Steel Uncork'd XL Wine Glasses are the largest triple-insulated, stainless steel wine glass in the world. 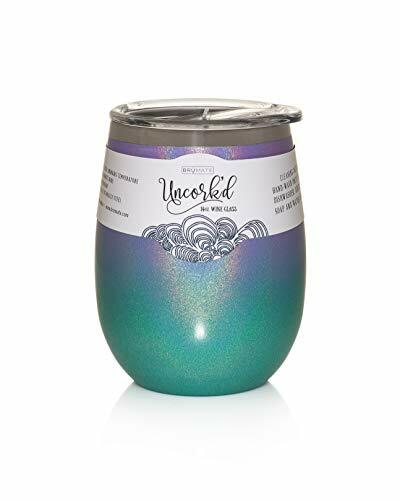 They were designed to hold 14oz of your favorite wine and keep it the same temperature from the time you uncork your bottle and pour until the last drop. Holds over 1/2 a bottle of wine. Limited Lifetime Warranty. * Please make note that this is a painted finish. Do not put in abrasive cup-holders or other abrasive areas to prevent damage to the painted surface. THE LARGEST TRIPLE-INSULATED Uncork'd XL: holding over half a bottle of wine, the BrüMate Uncork'd XL lets you relish your wine, cold/hot drinks just the way you like them by keeping them at the same temperature from the time you pour them in till to the last drop STAYS COOL AND DRY TO THE TOUCH: the exterior of the Uncork'd XL will always stay cool and condensation-free, so you'll be able to hold it comfortably and enjoy your drinks in style CRAFTED FROM DURABLE, FOOD GRADE STAINLESS STEEL: no worries about shattering the Uncork'ed XL as it's made of premium gauge 18/8 stainless steel with superior quality powder coat that's rust resistant; go on, make fragile glasses history! REMOVABLE SPLASH-PROOF LID: the Uncork'd XL comes with a toxin-free clear plastic lid with a thoughtful slide tab that makes it convenient for you to insert a small stirrer or straw FLAUNT YOUR STYLE: the Uncork'd XL comes in a dazzling range of finishes that will match every occasion; can't decide whether to get that gorgeous glitter or timeless matt look? Get BOTH!